Coffee and I have a love-hate relationship. I love it dearly, but I hate getting to the point where I "need" it to function. So I try to only drink it when I really want it, rather than when I really have to have it. 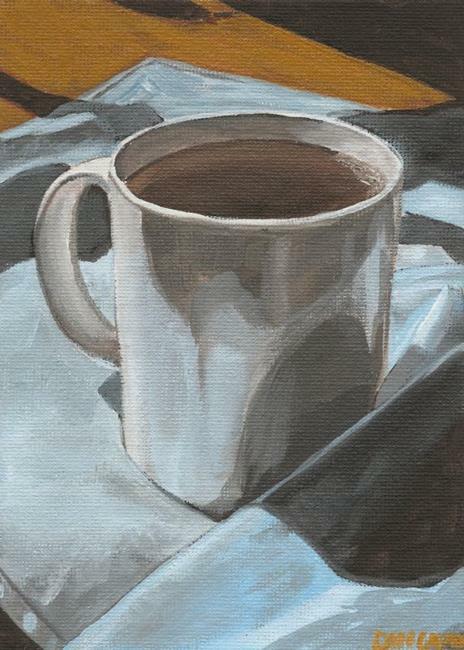 In painting this seemingly white coffee cup, I realized that I would more likely be painting everything but white. I chose a light, calming blue napkin for the setting, with the morning sun for the light source. I darkened in the shadows, avoiding any actual black, and gradually brought both the table and napkin, in softly shaded browns and blues, respectively. When the cup was ready to paint, I used the same shades as were used for the napkin, avoiding pure white in all but the brightest highlights. I finished the actual coffee with an opaque, creamy brown, while still allowing a little depth to be gleaned. I feel this was a particularly effective still life, conveying through color and light a sense of calm.